This simple wood-and-stainless steel tool looks like a relic from grandma�s kitchen! But this basic corn cutter is an easy-as-pie method to strip kernels from the cob smoothly, uniformly and evenly�no splattering or making a mess. And it�s much safer than balancing an ear on end and using a sharp knife. 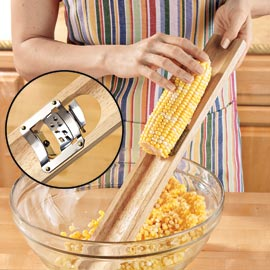 Even adjust the blade to wring all the juice from the cob�you�ve just made creamed corn! Acclaimed by chefs and home cooks alike. 17�L.